When JR discovers a clue to the identity of the kidnapper, Kruger comes out of retirement to reexamine the abductions. His ensuing investigation will lead him down a dark trail - one of dark money and even darker passions. Will Sean succeed, or will the past repeat itself? Tightly plotted with the trademark twists and turns of a J.C. Fields novel, The Cold Trail will keep you listening late into the night. You've probably heard the expression "Torn from the headlines", right? This audiobook definitely went down this road. I think in the series, I liked this book best of all. This is a cold case that Kruger comes out of retirement to solve. Women have disappeared and their bodies are never found. There are politicians involved and a lot of money. When I was getting to the end of this audiobook, I remember thinking "Robert Mueller's on one end and Sean Kruger is on the other. When Kruger is solving this cold case, he inadvertently uncovers political intrigue". This storyline was a great example of how politicians can be influenced. Fields provided detailed backgrounds for his villains, the path they took and how they ended up completely corrupted. Fields writing is very tight. This mystery is a box of puzzle pieces. Through Kruger, we see the pieces being dumped out, but out of order. Kruger and his team methodically gather the information and sort it. It feels unfair at times that criminals can break the law yet lawmen must stay within the law to catch them. What I enjoy is that Kruger doesn't play that way. His concern is with stopping the criminals from hurting other people. He does have a code but it isn't always lawful. He is a flawed hero who is torn between wanting to be with his family and doing what it takes to apprehend the criminal he is pursuing. I also love the ongoing Keurig vs Mr. Coffee debate between Kruger and JR. I am really enjoying Paul McSorley narration of the Sean Kruger Series. His voices for each character are distinct and consistent. For the most part, the protagonist Kruger is a deep thinker and McSorley's narration reflects that. Fields and McSorley are a great combination and if there are any more in the Kruger series, I hope McSorley continues to narrate them. J.C.Fields will never have been enjoyable without the down to art narrator, Paul J Mcsorley. Please to get a better taste, listen to the first 3 series bundle, and also never listen that without this too. They are an intertwined scenes that you are never supposed to miss. I was not a detective oriented person, but after having listened to these pieces. I will no longer ignored stories of this kind in the future. Don't hesitate to get your copy soonest. May God bless your listening. Amen. This book continues the series of stories about Sean Kruger an FBI agent who becomes involved in a series of missing women. It turns out that he becomes involved in the cover up that was to protect the son of a senator. He remembered cases from the past and when he gets involved in this he is able to bring the people to justice. This story line was superb with a lot of mystery and danger involved and ended in Sean being able to conclude his investigation. The narration was good with fully understandable speech and a multitude of voices for the various characters. This Series keeps getting better! The Cold Trail is as good, if not better, than the earlier volumes of the series and, as always J.C.Fields does not disappoint! This is an easy 4 Star book. I listened to the audio edition and McSorley did a great job narrating! The Cold Trail: The Sean Kruger Series, Volume 4. Superb. A 5* read/listen. Fast paced with real depth characters and all believable. I throughly enjoyed this book as I have all in this series. 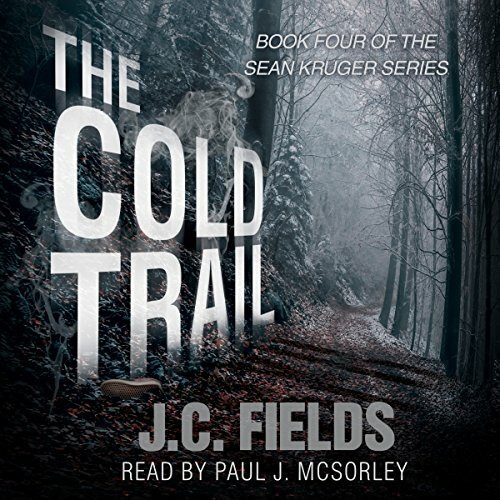 J.C Field's "Sean Kruger" and Paul.J McSorleys narration of this book is an award winning combination.. I highly recommend this series. This is the 4th book of the Sean Kruger series I have read. I enjoyed it as much as the other 3 and hopefully JC Fields will keep them coming. The story starts back in the past, 17 years back to a case that Agent Krueger had been unable to solve. Fast forward to present time and Krueger is back working with the FBI trying to solve a new case that seems oddly familiar to the cold case. Once again he enlists the help of his friend JR Diminiski. The book brings back many characters from his previous books and I love the way that we are kept in the loop as to what has been happening in his life as well as the lives of his friends and family. The story kept me so intrigued that I had trouble putting it down. Once again the narration is done perfectly. I was given this free review copy audiobook at my request and have voluntarily left this review. Will Sean finally solve a 20 yr old cold case? Former FBI agent, Sean Kruger, is now a university professor...and hating it. When a grad student from campus is abducted, Sean can't shake the similarities between this case and cold cases from 1999-2002. Sean has never gotten over the fact that he did not solve those cases and he decides to revisit them...with all of the technological advances over the years, he should finally be able to bring closure to the victims' families. Sean enlists the help of his hacker friend, JR Diminsky, to figure out the mystery...what they uncover isn't pretty. Politics, power, money, human trafficking...can Sean overcome all of this to bring a killer to justice? This is another action packed story in the Sean Kruger series that will leave you gasping and saying 'well heck, I never saw that coming'! Narration is on point and pulls you into the story. Hope this is not the end of the series! I voluntarily accepted a complimentary copy of this book in exchange for an honest review. JC Fields and Paul McSorley combine talents again to produce a contemporary adventure that seems to listen to the wind and pull puzzle pieces together. The end result is a savory treat, just below the surface of the happenings in the "real " world. Sean Kruger has evolved into a likable hero with his partner, JR, the computer wizard. Fields weaves tightly, telling his story with a steady rhytm of scene, characters, dialog, scene, characters, moving forward and pulling us gently with him in the battle of good vs evil. I am still waiting for the Sean Kruger series to made into movies. I enjoy the Kruger series. The narrator done a great job telling the story. Looking forward to listening to more books by this author!